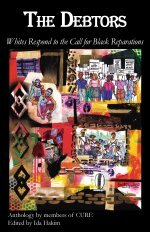 Read reviews, chapter descriptions and excerpts from "The Debtors: Whites Respond to the Call for Black Reparations." We've also made available an excerpt from CURE's Amicus Brief in support of Deadria Farmer Paellmann's Corporate Restitution Petition to the US Supreme Court. Most would agree that CURE is a unique organization undertaking a work of great magnitude. While we are proud of the work of the organization, in "Justice as a Way of Life" we invite the public to look beyond our organization and see the work that CURE members are doing as individuals, in their daily lives. Reparations, social justice, white privilege, racism, racial discrimination, white supremacy, the distribution of wealth and the legacy of slavery - these subjects are being brought to the forefront by teachers, researchers, writers, filmmakers and leaders who are also members of CURE. We are pleased to highlight these efforts with a brief deseciption of the areas of work and links to websites, blogs, articles and other writings.